PayPal's latest service, Pay After Delivery, gives people up to 14 days to pay for the stuff they buy. This means you can get a two-week loan from PayPal to make a variety of purchases, at no extra charge from the online payment company (though the fine print notes that third parties might charge you). This doesn't mean you can get cold hard cash from PayPal, but you can make some pretty big purchases, since the spending limit is up to $10,000. To use Pay After Delivery, you need to give PayPal a valid bank account number, and it'll attempt to debit that account once the 14 days are up. If you don't have enough money in it, the remaining debt will roll onto your PayPal account, a credit card, or another debit card. PayPal is one of the granddaddies of online payment, but competition is getting fierce as mobile payment services like Apple Pay and Google Wallet are making it convenient to use bank cards in a digital setting, and former complementary services like Etsy are rolling out their own payment options. 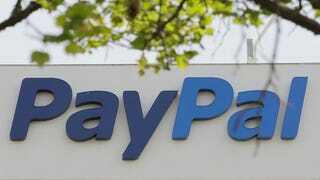 This is a way for PayPal to offer something novel again.